President Obama is getting serious flak from all sides now, with the Big 3 “Scandals” facing him squarely in the face. President Obama is getting serious flak from all sides now, with the Big 3 “Scandals” facing him squarely in the face. He really needs some good news on the health reform front — especially as Tea Party cognoscenti are using one of those controversies — the IRS one — to drive home to its faithful that the federal agency is directly responsible for all that we know Obamacare to be. 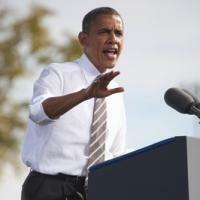 Obama is on the cusp of a nationwide re-introduction tour, of sorts, designed to persuade voters of the law’s merits. Although the WH will be the first to say that it is unconcerned with the repeated grandstanding of activist groups from the right — the Tea Party, included — it is wasting no time getting the president to trumpet his signature domestic achievement, you know … just in case.